This program provides leadership training and financial assistance up to a maximum of Rp 6.280.000 per annum to cover tuition, other school and basic needs. Goodwill invites students of the Agrucultural Bogor University (IPB) in the second, third and fourth year to submit their applications. Scholarship will be awarded for the 2019-2020 academic year. 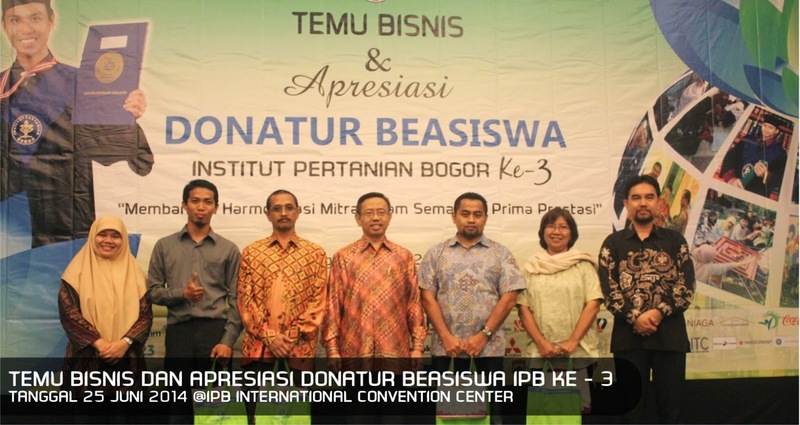 Yayasan Goodwill International is an independent, non-profit community service organization registered with the Dinas Sosial. 1. Must demonstrate financial need, or special circumstances, indicate parents and/or supporting family member’s gross salary. Some form of documentation of financial situation should be attached, including parents electric bill, parents phone bill. 2. Must have a high Grade Point Average (GPA) and submit the official copies of academic transcripts of the past 2 semesters for the second year students and the past 3 semesters for third and fourth year students. 3. Must demonstrate leadership qualities through activities at school, in the community, in other organizations or work part time. All applications will be evaluated by the Goodwill Scholarship Selection Committee. Applications will be individually assessed based on the above creteria and on the quality of the answers provided to the questions and essays which are part of this application. Applications does not guarantee receipt of scholarship. Program TELADAN dari Tanoto Foundation merupakan sebuah program pengembangan kepemimpinan yang dirancang untuk membekali generasi muda Indonesia menjadi pemimpin masa depan. Program TELADAN cukup unik, karena selain memberikan dukungan biaya kuliah penuh, juga memberikan dukungan berbagai pelatihan dalam bidang pengembangan diri dan karier, dukungan untuk memiliki wawasan internasional, serta dorongan untuk memenjalankan kegiatan sosial bagi pesertanya. c. Mengalami kendala pembiayaan untuk melanjutkan studi yang diakibatkan oleh ekonomi orang tua/wali menurun dan/atau tempat tinggal keluarga rusak. Silahkan mengisi Formulir Online untuk pendaftaran BIDIKMISI angakatan 55 (2018) di http://bit.ly/onlinebmkhususlombok dan melengkapi berkas yang di download http://bit.ly/bmlombok . Untuk Beaiswa PPA silahkan mengisi Online di http://bit.ly/onlinePPAlombok dan melengkapi berkas yang di download di http://bit.ly/ppalombok . Batas Pengumpulan Berkas 17 September 2018. 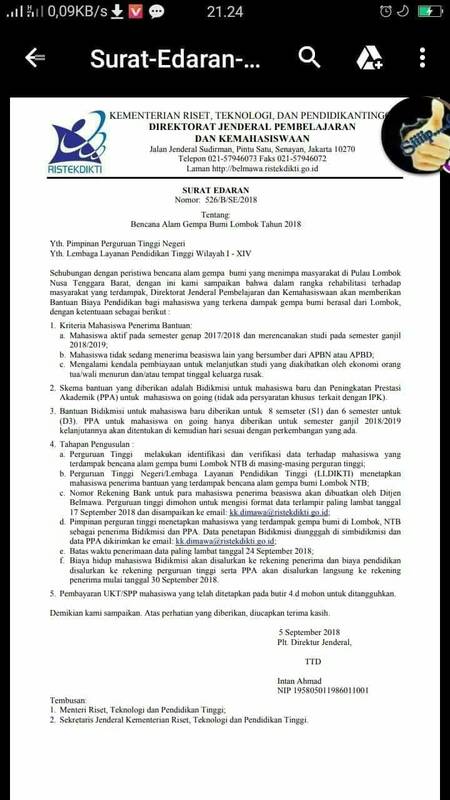 MOHON DIPERHATIKAN akan dilaksanakan PERTEMUAN Pada Hari SABTU, 15 SEPTEMBER 2018 di Ruang Rapat Dit Ap Lantai 1 Gd. Rektorat pada PUKUL 09.00 WIB.